After almost half a century of teaching, Ramapo College celebrated the career of an admired faculty member, Dr. Gordon Bear. 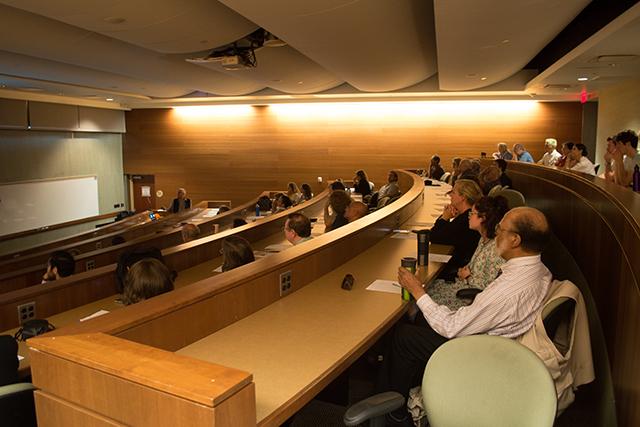 To be exact Dr. Bear stated he has been “professoring for 96 percent of a half-century,” as friends and colleagues packed the lecture hall in the Anisfield School of Business as the psychology professor gave his retirement speech Wednesday afternoon. His ideas were demonstrated using multiple concept maps, explaining that this was his preferred method of teaching. Dr. Bear claimed that on multiple occasions he was able to fill a 40-foot long white board with concept maps and would therefore always encourage students to take a seat from the front row. He also touched on the correct way to read and highlight a textbook and then passed out a reading passage so everyone could practice his or her highlighting skills. “The best retirement gifts will be your close attention, your vigilant skepticism and our subsequent interlocution,” Dr. Bear said. Touching on skepticism, he offered extra pieces of chocolate to anyone in the audience that could find a mistake within his work. He explained that he made similar offers to the students in his classes. Any student that found a mistake, either spoken or written in the textbook, was rewarded $2. 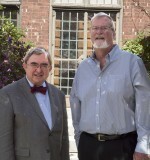 Dr. Gordon Bear first came to Ramapo College of New Jersey 43 years ago in 1974 when some of his now colleagues were still college students. Before coming to Ramapo, he began his teaching career at the University of Wisconsin, Madison campus. He explained that there his smallest class was 90 students. Dr. Bear took the time to thank Ramapo College for being so welcoming to him when he arrived. Dr. Bear received his B.A., M.S. and Ph.D. from Yale University and has since taught numerous courses at Ramapo including statistics, social psychology and evolutionary psychology. Ironically, Dr. Bear never intended to major in psychology. When he attended college he hoped to study music or mathematics, however he joked, “I learned my skills in both those fields were mediocre.” He was then inspired to study psychology by a professor at the time. Dr. Bear also wished to dedicate his labors to all of his colleagues, coworkers and students who carry on in spite of their chronic afflictions, such as migraines, depression, grief and diabetes. He noted that those people who work despite their continuing illnesses were an inspiration. Today was not Dr. Bear’s last visit to Ramapo, as he will be back in the Spring semester to lecture on the topic of scientific psychology.